Paint the entire outside and inside surface of the pot red. Let dry completely. On a mixing surface place some black paint and then blend together half and half black and red paint. Use the blended color and flat surface of the brush to create horizontal and vertical lines on the terra-cotta pot. Try to space them apart evenly. Let dry. Use the black paint to paint in the overlapping squares. Let dry. 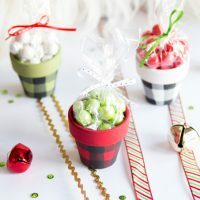 Fill the mini pots with goodies of your choice such as kisses chocolates or candies. Repeat to make white and the green pots.